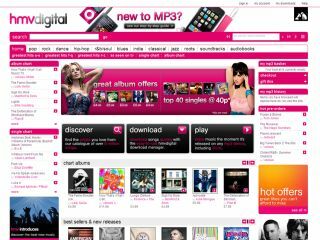 Following the acquisition of 7digital last year, HMV has launched its own music download portal. HMV Digital is part of the company's plans to become - or return to - a 'superbrand' in the entertainment sector, taking on the iTunes Goliath with a wallet-friendly 40p per top 40 single launch offer. The PC and Mac-compatible online service includes a download manager, which synchronizes with your iTunes library or Windows Media Player. Users will be able to pre-order tunes, gift purchases to their mates and - most impressively - re-download previous purchases for free. "We are delighted to launch a world class download store that reflects both HMV's music retailing heritage and our strategy to be a broad-based entertainment brand," said HMV's head of online and digital Sarah Hughes. HMV's store will be operating in a cramped marketplace, with the likes of Amazon already well ahead in terms of attempting to topple the dominant force of Apple. But with the welcome addition of re-downloadable content and - if the introductory deals are a sign of things to come - the low price, you'd be a fool to dismiss them just yet.